We don’t want to advertise here, on the contrary. I think Shell built quite a boring game and wasted 2 Minutes of my life. The most interesting thing is to take a look at the cockpit. We have the feeling, we have seen this before. Need to remember, we do not ask these F1 teams for permission in first place to replicate there vehicles and release them to public. So it goes both ways really. But David, Shell earn money and we don’t lol. Oh my….. Way to go Shell :S F2005 cpit and I love their work on the hands! Aren’t you going to actually contact them? Why it’s not hurting anyone? Ok, I don’t want to be associated with money-thirsty oil-company with blood on their hands and despite that it’s an offendingly boring game. Those hands look pretty real. 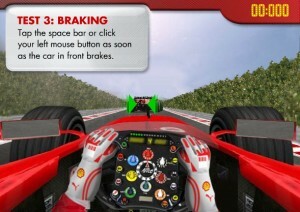 Name one formula one driver who doesn’t drive with his hands vertical. I don’t understand some details of this topic.. Previous Previous post: So back to work it is……..